The port city of Liepāja is the music capital and beachfront getaway for Latvians. Latvia won the Eurovision competition in 2002. In Liepāja, you can't miss the 1st Latvian Rock Cafe and the Musician's Walk of Fame alongside it, as well as the enormous upright guitar. It's the third largest city in a pretty small country, and Liepāja has evolved from its Soviet slumber with determination, but a morning drowsiness which hasn't been helped by Latvia's 18% drop in GDP in the first three months of 2009. 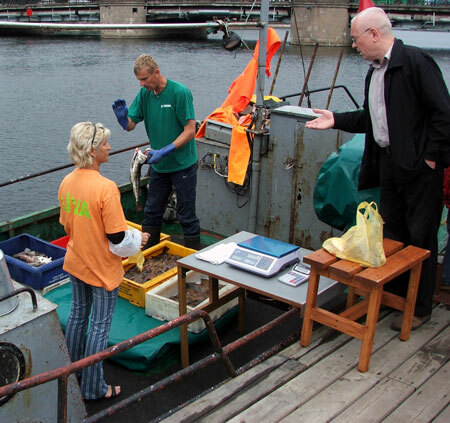 For us, we found Liepāja to be without pretense and filled with youthful energy. Upon our arrival in Liepāja, we were greeted with a performance of traditional Latvian dancing in the town square. 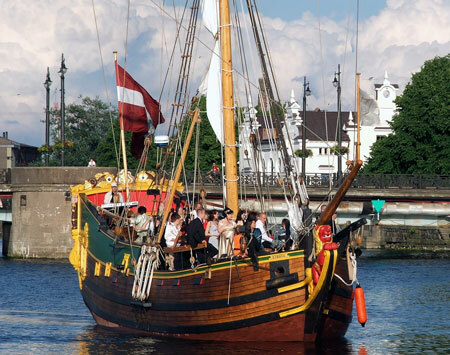 The wooden ship Libava (the former name for Liepāja) is a replica of a 17th-century sailing vessel. This replica was built in St. Petersburg by the same builder that created the ships for the Pirates of the Caribbean movies. 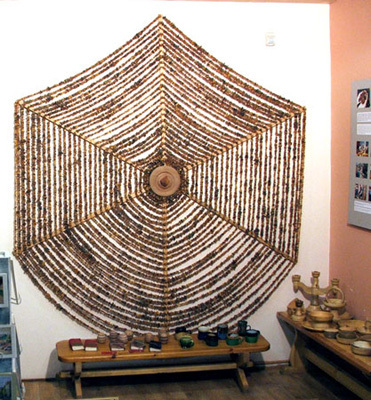 To celebrate Liepāja's 750th anniversary, the people donated thousands of pieces of amber, many of which were strung into this 135-meter necklace. Many of the leftovers were fashioned into an "amber clock", which isn't a clock at all, but an hourglass-shaped amber sculpture on the promenade at the harbor. When the fishermen come back to port, there's a line at the dock waiting for them. 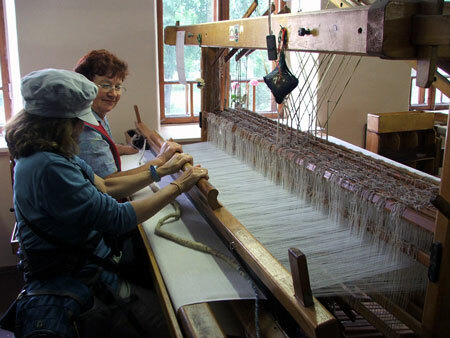 We visited the "house of craftsmen" and watched the ladies making tablecloths and other fabrics of cotten and linen. Karen took a turn at the loom, and now she's the proud producer of about a micron of tablecloth. 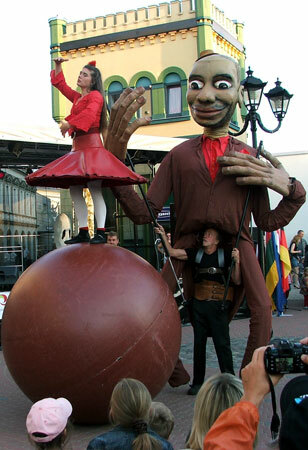 We were in Liepāja for the Theater Festival, and watched this unusual performance of a woman who walked on a ball, accompanied by her huge puppet of a boyfriend. 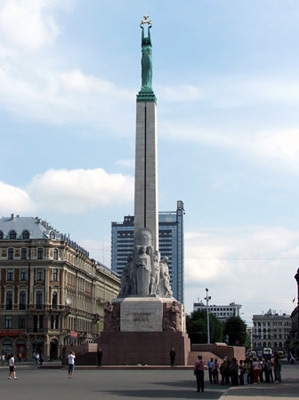 Riga's Freedom Monument was built in 1935, one of the few times in Latvia's history that the country wasn't occupied or ruled by someone else. This monument is a national shrine for Latvians, and there are always flowers at its base to remember those who were deported to Siberia by the Soviets. There's a changing of the guard every hour. 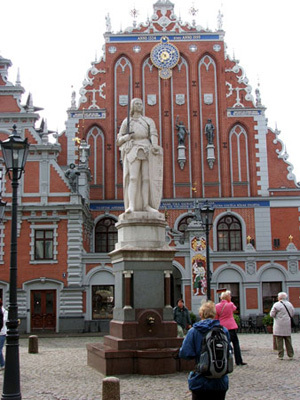 This beautiful building in Riga, originally from 1344, was destroyed during World War II in 1941 and then pulled down by the Soviets, who disapproved of the "decadence" of the architecture. It was originally used as the base for a German merchant society.